Hi readers! It’s been a while since I wrote my very first entry in Track That Travel. Today, I will share with you my travel to Seoul, South Korea, a place that I would love to go back to anytime. I was a Korean drama (kdrama) fan since 2005 when I watched my very first kdrama, Lovers in Paris. And until today, I still watch kdramas fondly. When I learned that my very first out of the country travel will be in Seoul, I was so elated and excited. 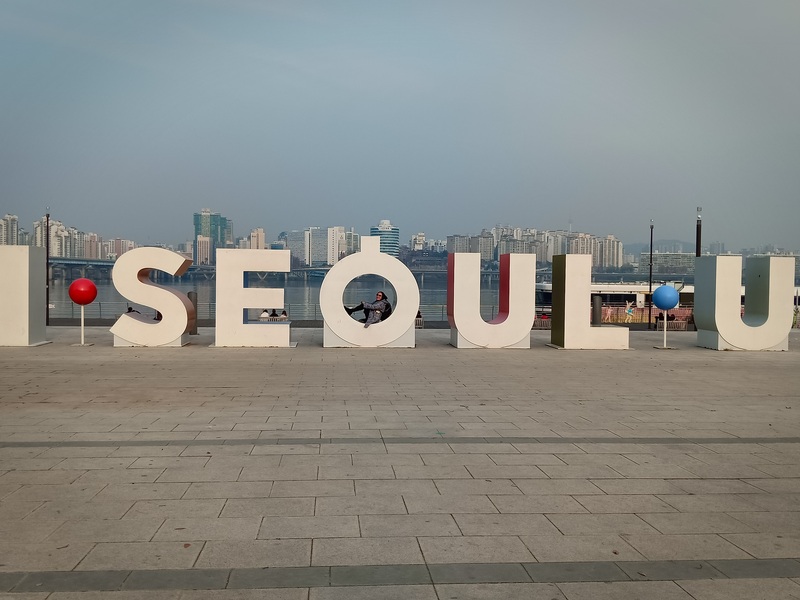 However, my first time in Seoul was not exactly what I expected because I did not get the chance to visit some of its most famous spots like Nami Island, Han River, Hongdae, N Seoul Tower and other famous places. That’s why I promised myself that I would go back to Seoul just to see and visit Nami Island and N Seoul Tower. I chanced upon a promo flight to Seoul thru Cebu Pacific, a local airline here in the Philippines. I travelled on November 24 to 27, 2018 with 2 of my friends who also happened to be kdrama fans. So we decided to have a kdrama themed visit to Seoul and visited some famous kdrama locations. Read below for the complete lists of the kdrama locations we visited. First on our list is Nami Island. Our first day (November 24, 2018) in Seoul is dedicated to Nami Island. We were all excited to visit this place because it magically transforms itself every season: A touch of green in summer; touch of pink in spring; touches of vibrant oranges and yellows in autumn and a touch of white in winter. And Seoul did not disappoint us. On the morning of our visit to Nami Island, it snowed for the first time for 2018. It was a whole new experience. Philippines is a tropical country and we didn’t get to experience snow. That’s why seeing it for the first time is truly one of the highlights in my entire life! And not every Filipino is given the rare chance to experience snow first hand. Back to Nami Island, the island is a half moon shaped place located at Gangwon Province. It is a 2-hour journey from Seoul. It is also the grave of General Nami, a famous general during the Joseon Dynasty and which the island was named after. To kdrama fans, Nami Island is the famous filming location of Endless Love Winter Sonata and many of the places in the island have odes to the said kdrama. Be sure to take pictures of the famous sequioa-lined trees of the island. Other kdramas shot in the island are: Rosy Lovers (2014-2015), High School King (2014). Address: 1 Namisum-gil, Namsan-myeon, Chuncheon, Gangwon-do, South Korea. On our 2nd day in Seoul, we visited Myeongdong Cathedral, MBC World, Cafe Blute, Han River and 63 Square Building. Myeongdong Cathedral is located in downtown Seoul. It is the birthplace of Roman Catholicism in Korea. Also near the cathedral is Myeongdong Shopping Street and Namdaemun Market. Kdramas shot in this location are: Devilish Joy (2018), Black Knight (2017-2018) and Beautiful Days (2001). Address: 74 Myeongdong-gil, Jeodong 1(il)-ga, Jung-gu, Seoul, South Korea. MBC World is Korea’s first hallyu theme park opened by Korea’s major broadcasting station, MBC. The park offers hologram K-pop concerts, virtual reality drama sets and more. Kdramas shot in this location are: I’m Not A Robot (2017-2018), Kill Me, Heal Me (2015), She Was Pretty (2015), Pinocchio (2014-2015), Mr. Back (2014). Address: 03925 267, Seongam-ro, Mapo-gu, Seoul, Korea. Cafe Blute was formerly known as Four Seasons House as some scenes from the Endless Love series were shot in this place. At present, it prominently features the scenes from Endless Love: Summer Scent, wherein Song Seung-hoon’s character proposed to Son Hye-jin’s character in the Proposal Room. Aside from the Endless Love series, kdramas shot in this location are: Weightlifting Fairy Kim Bok-joo (2016), Love Rain (2012). Address: 12 Wausan-ro 14-gil, Seogang-dong, Mapo-gu, Seoul, South Korea. The Han River is the 4th longest river in South Korea. Han River used to be a trade route to China (via the Yellow Sea) in early days. At present, it is not just used as a kdrama location but also a place for relaxation among locals and tourists. Some of the kdramas shot in Han River are: Your House Helper (2018), Why Secretary Kim (2018), Strong Woman Do Bong-soon (2017), Tunnel (2017), Two Cops (2017-2018), Bride of the Water God (2017), W Two Worlds (2016), My Love From The Stars (2013 to 2014). Address: Seoul-si, Gangwon-do, Chungcheongbuk-do, Gyeonggi-do. 63 Square Building is a short walk from the Han River. The 5th tallest building in Seoul. Built as a landmark for the 1988 Summer Olympics. The building design is based on the Hanja character for person or human being. The 60th floor of the building houses the world’s highest art gallery and an observation deck called the 63 Golden Tower. When we visited, the featured paintings were about coffee, which I so love because I am a certified #coffeelover. The lower floor houses the Aqua Planet 63. Kdramas shot in this location are: Live Up To Your Name, Dr. Heo (2017), Bride Of The Water God (2017), Legend Of The Blue Sea (2016-2017), My Girl (2005-2006). Address: 50 63-ro, Yeoeuido-dong, Yeongdeungpo-gu, Seoul, South Korea. On our 3rd and last day in Seoul, we visited Grevin Museum, Gyeongbukgung Palace, Bukchon Hanok Village and N Seoul Tower. Grevin Museum is a wax-themed museum that houses wax-figures of Korean as well as foreign stars. The museum was founded in 2015. Address: 23 Eulji-ro, Euljiro 1(il)-ga, Jung-gu, Seoul, South Korea. I recommend you to visit Seoul because it offers a variety of activities and tourist spots for adults and young ones. Please feel free to drop some comments if you have questions regarding Seoul. I would love to answer them to the best of my knowledge. ’Til my next travel blog!